Normally I don't like to post about things that the blogs I follow post about, but this is a special case. 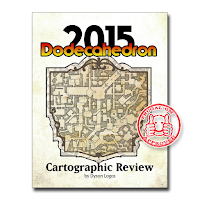 If you didn't know already, Dyson Logos has a collection of the maps he made in 2015 available over at DTRPG. ...and this sale price, which is the DTRPG Deal of the Day, only lasts for the next 20 hours or so. This isn't a review, but after picking this up, it is a no-brainer for this week's review. Don't wait for the review though....just pick this up while you can.